Admit it ….. You started a Home Business because you always wanted the freedom of not working for someone and being able to quit your job. Network Marketing caught your attention when you saw how much money people were making – and you wanted that too! The leverage of this business model can be breath-taking and powerful, in the right business. If you've been in Network Marketing before and haven't made any money – it's not your fault. Training is important but having a system in place will get you instant results! If you are one of those that made money then you know what I mean! The top earner of a well known company had amazing results saying very little to people and just plugging them into the company system. He barely spoke English and when he met people he would ask them “Do you want to make money? Yes/No?”. If “yes” he quickly got them into the company system. It took him to the top – Wow! It was after meeting “Mr. Yes/No” that my friend and mentor, Robert Hollis, realized that anyone can do this business. All you have to do is “say as little as possible – to as many people as possible – as fast as you can” and plug them into the system. Over the years Robert became the Top Earner in seven companies. He built organizations of over 750,000 people, earned over $54 million, created more than 50 millionaires, and taught ten's-of-thousands of people how to break-away from the 9 to 5 Rat Race and never work a job ever again. 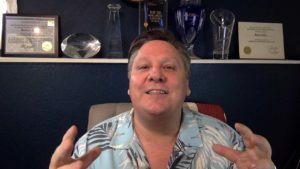 Robert retired from network marketing and continues coaching and speaking – teaching me and others how to do what he did. He loves helping people succeed and continues to show people that anyone can build a thriving business. Robert is out of retirement! Robert's wife, Teri, loves animals and wants to raise money for them. She approached Robert at the same time that he was evaluating a company for a friend. Well, long story short….. Teri joined this company and Robert is committed to helping her become the top earner and growing her organization larger than anything he's ever built!! If you're new to this industry and you've struggled – this is your shot! Have the Company do your presentation, product training, compensation overview, follow-up, etc. All you have to do is turn on the faucet and drive people to the system. Then just Point, Guide and Direct people through the system. Check it out – This is insane! We can show you how to do what we are doing – step by step! Robert's training will show you exactly what to do to get immediate results! If you are an experienced Entrepreneur or Network Marketer you can finally build a big business without having to be “The Deal” – Just edify Robert and the System, plug them in, answer any question by “Point – Guide – Direct”. For the Beginner or the Experienced this is so simple and easy to duplicate. In just over 8 months there are over 22,000 people in the Vision Group. Do me a big favor – check this out by taking a free tour. If it's not for you, I know for a fact that you will know someone that wants to build a business and make money. Someone who wants to alter their life. Someone who wants a new beginning. Someone who wants to quit their job and never work for someone else, ever again. I'll add you to the Group and Tag you in the training and get you some free Gifts! Don't hesitate – take your free position and watch your organization grow even before you upgrade!